Your radar, or "minimap", provides important information to you about your teammates and your enemies. It is important to frequently check the radar to avoid attacking a friendly unit and to learn new enemy positions. In competitive mode, you have the option of having all of your teammates be a different color on the radar. This can be controlled with the cvar cl_teammate_colors_show 1. Enemies will show up on the radar if you or a teammate spots them within 90 degrees of total FOV, as shown above. Enemies do not show up based on sound - decoys do show up based on sound, which is one method of determining if a dot is an enemy or just a decoy. Enemies should not show up if a smoke is in the way, though CS:GO does have a random bug that sometimes lets that happen. As per usual, Valve has claimed to fix this bug many times but it still does sometimes appear. 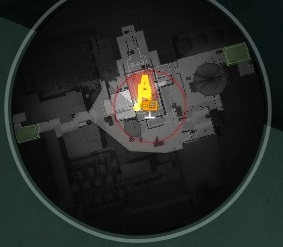 Radar also shows the relative elevation of teammates and team-objective objects such as hostages or bombs. There is a T shape that distinguishes if the object/player is above or below you. If the T shape is absent, they are at the same elevation. The T points the direction of the object. There are a few customization options for the radar. This command changes the position of your icon on the radar. A value of 0 will keep the map in a central position while your icon moves around freely. A value of 1 will keep your icon in the center of the radar and move the map up, down, left, and right relative to your position. This will dictate which part of your radar stays stationary, and which part will rotate. A value of 0 will lock the map and your icon will rotate in relation to your direction. A value of 1 will lock your icon and rotate the map based on the direction you are facing. This will change the size of the map inside of the radar, zooming out will show more accurate locations of players. This will change the size of the icons on your radar. Many people enjoy streaming their gameplay to Twitch TV or YouTube. For example, the clan streams many videos to its page. It's a great way to show off your playing and participate in the community. The ability to stream and the quality of your stream will rely heavily on your video card, CPU, and internet upload speeds. You will need to download and install a program to stream the video game for you. Open Broadcast Software is a highly popular, free, open source program for streaming. Xsplit is also quite popular but contains a paywall for some features. You can link your Twitch account to your Steam account. If you do this, your stream has a chance of showing up in the "Watch" tab of the in-game Counter-Strike:Global Offensive menu. Counter-Strike has always had a really strong map making community. Some of CS:GO's official maps started out as community maps at the beginning of Counter-Strike's history. A basic tutorial for map making can be found on Valve's developer wiki, and the steam forums contain a map making support forum. The most popular mod for Counter-Strike is SourceMod. User generated content and support for making SourceMod plugins can be found at the AlliedModders website. When you start trying to increase your repertoire of viable guns, it's important to take into account their strengths and weaknesses and be sure to play to them. Most guns are less accurate when moving. The sniper rifles are the worst offenders, so people develop techniques of getting themselves to stop moving exactly when they are about to fire. Some choose to tap shift the moment they let go of their move key, and others choose to tap the opposite direction. This causes you to stop instantly instead of requiring a slow down. Chances are if you missed that awp shot when you were right on him, it's because you were moving when you shot it. Other rifles are slightly less inaccurate while moving. If you're shooting at close range, it's not too horrible to move around a bit while shooting. If you're trying to hit people at long range, though, be sure you're not moving while shooting as this will increase their accuracy. Submachine guns and shotguns are meant to be shot while moving. You shouldn't be shooting them at long ranges (if you have such a weapon be sure you put yourself into positions where you will only encounter enemies at short ranges as much as possible) and they can be controlled very easily while moving. When using a submachine gun, a shotgun, or a pistol at close range, use a technique called circle strafing. (I couldn't find a good video for Counter-Strike, but this video from TF2 illustrates the concept.) When circle strafing, put yourself into close quarters with the enemy and strafe around them in a circular motion, and they won't be able to keep up. Circle strafing is a great close quarters technique and especially useful when using submachine guns with lots of bullets. Pistols should be shot similar to rifles at long range and submachine guns at close range. Be sure to stop moving when shooting at long range, but at close range circle strafing is key. All guns can be sprayed if you understand their recoil patterns. However, you should always try to kill people in as few bullets as possible to reduce the frequency of reloading. Spraying should be limited to close quarters as spraying at long ranges is quite ineffective. Semi-automatic guns such as pistols and snipers should not be sprayed at all. The deagle in particular has a very extreme recoil and a very large recoil reset time and should be shot slowly and carefully. Submachine guns work best when sprayed but you should attempt to shoot controlled bursts at long ranges. One big problem new players have is they will get nervous and start spraying, especially when an enemy is spraying at them. Remember to always keep a level head and to stay calm. If your gun doesn't work well while spraying, then don't. The fact that they're spraying at you just means you have even more time to calm down and pick your shot, because they probably aren't going to hit you. Be sure that the weapon you choose matches the range in which you'll be fighting, and that you choose to encounter people in ranges that support your weapon. Don't buy an AWP if you're planning to go through apartments on de_inferno. AWPs are great long range weapons and terrible short range weapons, and apartments is entirely close quarters. Likewise, if your team had to do a save round and all has PP-Bizons, don't call a strat through outside de_nuke, as that is a very long range area. Certain weapons compliment each other very well. Others do not. A team full of AWPs can't cover each other very well. Be sure you are buying weapons that work with the strat being called, as well - don't just buy a weapon because you like it. These tips will revolve around playing defusal maps as they are more popular than hostage rescue maps. You can basically reverse all of the advice in here for hostage maps. This guide will have a lot of very general tips for playing each side. Teams can secure an advantage by purposely avoiding being so predictable, but these playstyles are popular because they're so successful. Generally, on a defuse map, the Counter-Terrorist have the advantage and the Terrorists are at a disadvantage. Most defusal maps are "CT-sided", meaning that you would expect the CT team to win a majority of the rounds. Defusal maps are CT-sided because if neither team did anything at all CTs would automatically win. That means that CTs simply have to play sufficient defense and they will win. Terrorist have the harder side in that they have to come up with effective offenses to take over a bombsite. Even if the Terrorists do manage to take a bombsite, they probably lost just as many of their own team as the CT side, and now they have to task of defending the bombsite until the bomb explodes against a CT team that knows where they are. Generally the CT team needs to defend two things - they can either choose to defend the bombsite, or they can choose to defend key choke points. 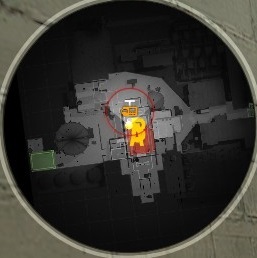 For example, on de_dust2, players will generally play in the A bombsite or in the B bombsite, or can defend middle (a major choke point to both A and B) or long double doors (a major choke point to A site). On CT side, it's important to continue watching your area until a bomb is spotted in a different region. Terrorists will try to fake you out by sending 3 or 4 people to one site while slowly taking the bomb to another site. Or they will send the whole team one way, get a pick, and then slowly rotate to the other site hoping that the CTs will leave their area. Stay put unless you know the bomb is not coming to your area so that you don't get flanked or faked. If you do have to rotate to the other bombsite, be sure you are still checking the path there. Don't get caught off guard by a Terrorist who is trying to pick off rotators. Buy smokes, flashes, and molotovs to delay the Terrorist team from entering. Remember, if time runs out, you automatically win. Don't run unless you've been specifically told to rush. As a Terrorist, you are naturally at a disadvantage. You need to funnel through a small choke point into an area where the CTs know you'll be. You need to be sure you can get the greatest advantage before entering the bombsite. Full team rushes anywhere usually fail hard. Your full team is running through one small area, which means that only first person will be able to flashbang, and you'll be easily sprayed down. 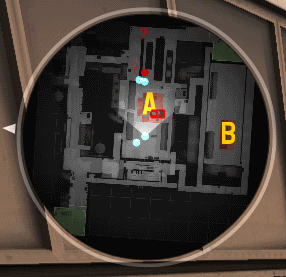 Every bombsite on every map has at least two entrances, and most have three. Entering from as many of these entrances as possible at the same time requires the CTs to split their attention and generally allows the Ts to set up two to three timed flashes instead of just one. Getting a pick as the Terrorist team before deciding which bombsite to enter also greatly increases your chances. Splitting up around the map and making controlled peeks to different areas in the hope of catching an unsuspecting CT off guard is beneficial. Once you pick of a CT, you don't necessarily want to full rush the site he was at. The other CTs might start rotating and you can get another pick as you catch a rotator. Be patient, but don't run out of time. Make your config.cfg file not read only. Launch the game and view your inventory. Close the game and change your config back to read-only. I disconnected from a match, reconnected and finished the game, but still got a ban. What gives? It takes about three minutes to get a cooldown ban from matchmaking. You will receive a ban if you don't reconnect within three minutes. However, after the three minutes is over, there is a small window of time where you can still connect to the server before the current round ends. If that happens, you will be able to reconnect and play out the remainder of the game, but you will still receive your cooldown.